The Rev. Angela Cipolla is our Priest in Charge. 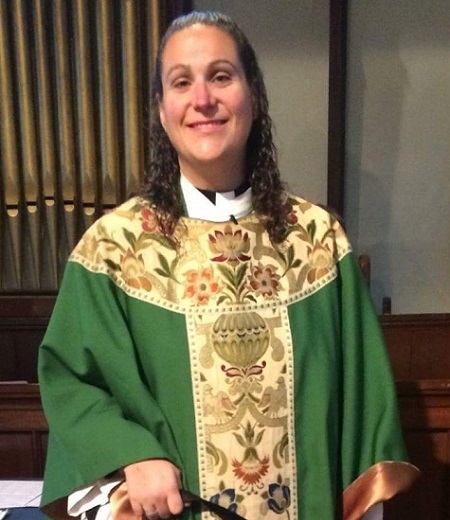 She is the 54th priest to lead Trinity since Edward Portlock conducted the first services in 1698. Please note that Mother Angie is on maternity leave through May 29. Recent sermons given before her leave are available here. Trinity celebrates the Holy Eucharist at 5 p.m. on Saturdays and 8 a.m. and 10 a.m. on Sundays, and on major feast days. 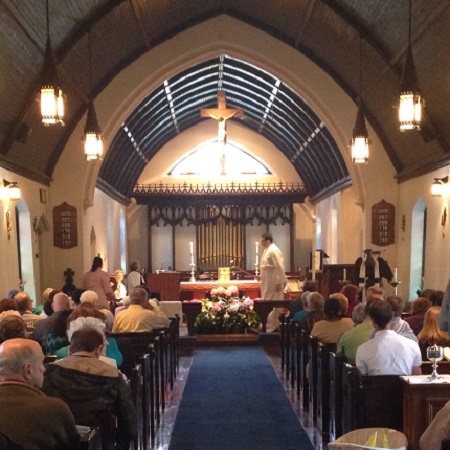 A Dinner Eucharist is held at 6 p.m on Wednesdays and Morning Prayer is offered at 9 a.m. on Thursday. See our worship schedule. Trinity runs a soup kitchen, food pantry and diaper bank, hosts homeless families as part of a regional Family Promise network and makes meeting space available for support groups. These efforts have been recognized by the Episcopal Church. Learn more about our outreach programs. The Jonathan Dunham House was built c. 1717 by former President Barack Obama’s earliest American-born ancestor. Since 1873, the house has been our priest’s home, or Rectory. The Dunham House is listed on the national and state registers of historic places along with our church building, first parish house and churchyard. Learn about our buildings and grounds. Please join us for our annual dinner from 4 p.m. to 6 p.m. on Sunday, April 7. Catering by Thistle. Tickets are $15 for adults, $8 for children under 8. 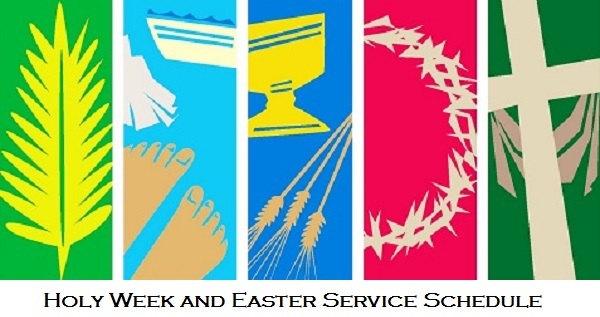 Call the church office at 732-634-7422 for more information. Support Trinity while you shop online through the AmazonSmile program. The church receives 0.5% of the amount of eligible purchases by customers who designate Trinity as their charity. Click on the image to get started. Your help is appreciated. 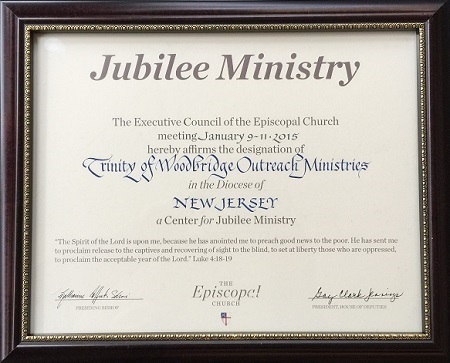 Our mailing address is 650 Rahway Ave. at Trinity Lane, Woodbridge, NJ 07095-3530. Our phone number is 732-634-7422. To send us an e-mail, click here. The Church Office is open from 5 p.m. to 7 p.m. on Monday, Tuesday, Thursday and Friday and from 8 a.m. to 1 p.m. on Saturday. To visit at other times, please call us and select ext. 101 to schedule an appointment.